In the interest of fairness, I thought I'd point out an instance where TSA officers actually found something potentially dangerous before it got on board a plane. I'm not sure how many times this has happened in the ten years the agency has existed, so I didn't want you to miss it. 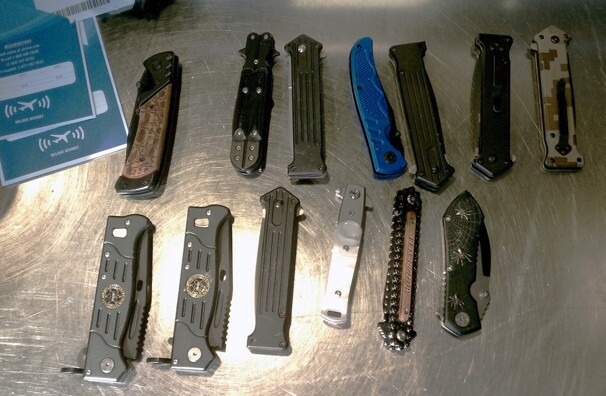 Our heroes noticed "something suspicious" at Baltimore-Washington International Airport last week, and the something turned out to be 13 knives inside a man's carry-on luggage. The 25-year-old man told officers that he is a knife collector, which might very well be true because (1) he had several different kinds, (2) terrorists only need one knife apiece, and (3) they would have a smarter weapon-smuggling plan than just dumping a bunch of knives into a carry-on bag. But this remains to be seen. I do want to point out that this success was achieved with the standard X-ray machine, not any of the "enhanced," expensive, invasive and pointless security measures that the TSA has come up with over the past decade. Had the man been carrying the knives, he would have set off the standard (and pre-9/11) metal detectors with no enhanced groping required. So this isolated quasi-success should not be taken as evidence that the TSA's efforts over the past decade have been worth a damn. Still, congratulations on your successful arrest of (most likely) a fairly dim knife collector.